Watch SIHH 2013: New Baume & Mercier Linea Automatic.Watches 2013 Baume & Mercier Linea Automatic is ready to debut at SIHH. Watches 2013 Baume & Mercier Linea Automatic is ready to debut at SIHH. The new collection of timepieces line concerning women come in a box of 27 mm with Swiss mechanical movement with automatic winding. 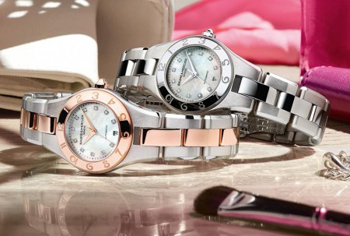 Since 1987, the year of the launch of Baume & Mercier Linea, this collection presents women’s watches are available in steel and gold, which are known for their perfect and subtle curvature of their chest that integrates seamlessly with the metal bracelets to match. This watch is very feminine, immediately recognizable by the characteristic engraving of its bezel, chose today an automatic movement ETA 2671 as a partner by showing it with pride sapphire crystal caseback along with Cotes de Geneve decoration of its rotor and perlage finish of the bridges. But the new line Automatic watches do not stop there: their bracelet is designed to achieve this flexibility in order to adapt easily to any wrist. The Baume & Mercier have invented a bracelet that incorporates a patented mechanism that makes it easy to remove it without the need for any tools. The brand has also created a series of interchangeable straps in leather or satin fabric in a wide range of colors. These two new watches line driven by a Swiss automatic mechanical movement shown on an elegant mother-of-pearl dial with 11 diamond hours, minutes, central seconds and date in a discreet window at 6 o’clock.